Quartz, silica, and flint are non-toxic materials having no known adverse health effects from ingestion. However, it does pose considerable hazards with respect to long term inhalation. CAS: 14808-60-7 Silica: ACGIH TLV & OSHA PEL: 0.1 mg/cubic meter 8 hr. 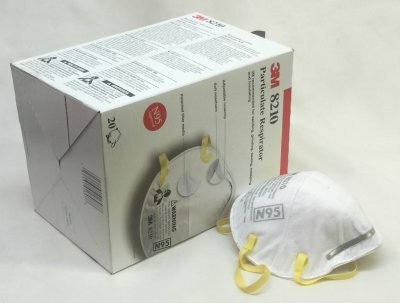 TWA, Respirable Dust. By comparison iron oxide is considered a safe-to-use material at a TLV of 5.0, kaolin is 2.0, barium carbonate is 0.5, quartz is 0.1-0.05. Silica is contained in many ceramic minerals (e.g. feldspar), including its pure form of flint. Inhalation over long periods will cause silicosis where fibrosis of the lungs causes shortness of breath and can lead to death in severe cases. Over exposure to silica weakens the body's defense mechanisms. Because of the abundance of silica, potential hazards are widespread. NIOSH in the US has estimated that 3.2 million workers in the USA are exposed to silica dust. Industries affected are quarrying, mining, steel, iron, metal foundries, abrasive blasting, construction, glass and ceramics, paint and pigments, granite and stone industries. The primary health risk is the inhalation of "respirable" particles smaller than 10 micrometers (about 1/2500th of an inch). Generally, the smaller the particles are, the greater hazard and potential injury to the lungs. Dust particles larger than these are not capable of penetrating the defense mechanisms of the lung. Prolonged exposure may cause delayed chronic lung disease-silicosis. Chronic silicosis may take many years of exposure to develop, but with acute exposure rapid development can occur. In latter stages of silicosis, known as complicated or conglomerate silicosis, lung function may be reduced, resulting in symptoms of shortness of breath. Quartz rock can be calcined so that it breaks down and grinds much easier. When this is done the material poses a much greater health risk. The International Agency for Research on Cancer (IARC) has determined from a review of human epidemiology studies that there is limited evidence for the carcinogenicity of crystalline silica. In the USA, occupational exposure is regulated by OSHA and under the laws of some states. The mining industry is regulated by the Mine Safety and Health Administration (MSHA). In 1992 the permissible exposure limit based on an 8-hour time weighted average concentration of respirable silica is .1 milligrams of quartz per cubic meter of air. OSHA and ASTM agree on this figure. Studies have been somewhat mixed in results, even where when confounding exposures of other carcinogens including radon and tobacco are involved. Findings on cancer risks associated with silica dust have made it necessary in some states that material safety data sheets reference the findings of IARC. Silica can be used and handled safely with appropriate work practices and the avoidance of prolonged exposure. Dust concentrations past the limit are invisible to the naked eye, so employers must monitor workers using approved sampling methods. See Crystalline Silica Q&A from National Industrial Sand Association, 900 Spring Street, Silver Spring, MD 20910. See The American Ceramic Society Bulletin Aug 2000 Page 60 for information on the Crystalline Silica Work Group of ACerS. This designation is an international standard for a general purpose respirator to filter out respirable quartz particles (which cause silicosis). Use one of these when working in a area where ventilation is insufficient to remove all of the dust. Use it also in circumstances where there is temporary generation of large quantities of dust. Do not wear this as a substitute for keeping floors and working areas clean. Quartz is one of the most dangerous materials used in ceramics, yet it is irreplaceable. It is the most abundant mineral on earth, we must learn to use it safely. Hazards of using ball clays in ceramics.